Liwa Thuwar al-Raqqa (the Raqqa Revolutionaries Brigade) was initially formed in September 2012 as a merger of several local rebel groups in Raqqa provincefollowing on from the Assad regime's loss of the northern border town of Tel Abyad, at a time when the regime was forced to pull back from large swathes of northern Syrian border areas to focus on defending more vital areas- in particular the provincial capitals. Liwa Thuwar al-Raqqa declared its loyalty to a "Revolutionary Military Council" in Raqqa province, a loose umbrella similar to other early nationalist rebel structures like the FSA Military Council of Col. Oqaidi in Aleppo province. Some declared components of Liwa Thuwar al-Raqqa at the time included [Kata'ib] al-Jihad fi Sabil Allah, al-Nasir Salah al-Din, al-Haq, Shuhada' al-Raqqa, Saraya al-Furat and Ahrar al-Furat. Over the subsequent months, some new local formations were announced and added to Liwa Thuwar al-Raqqa's ranks. Thus, in December 2012, the Katiba al-Risala of the village of al-Sheikh Hassan in the north Raqqa countryside, the Katiba Suqur al-Jaziraoperating in the western Raqqa countryside, and the Katiba Usud al-Tawheedoperating in Raqqa city area were announced as affiliates of Liwa Thuwar al-Raqqa. The rhetorical focus in these videos is on driving the Assad regime presence out of Raqqa province, rather than laying out an ideological vision for a post-Assad Syria. This is so despite its original emblem that ostensibly conveyed a distinctly Islamist orientation. 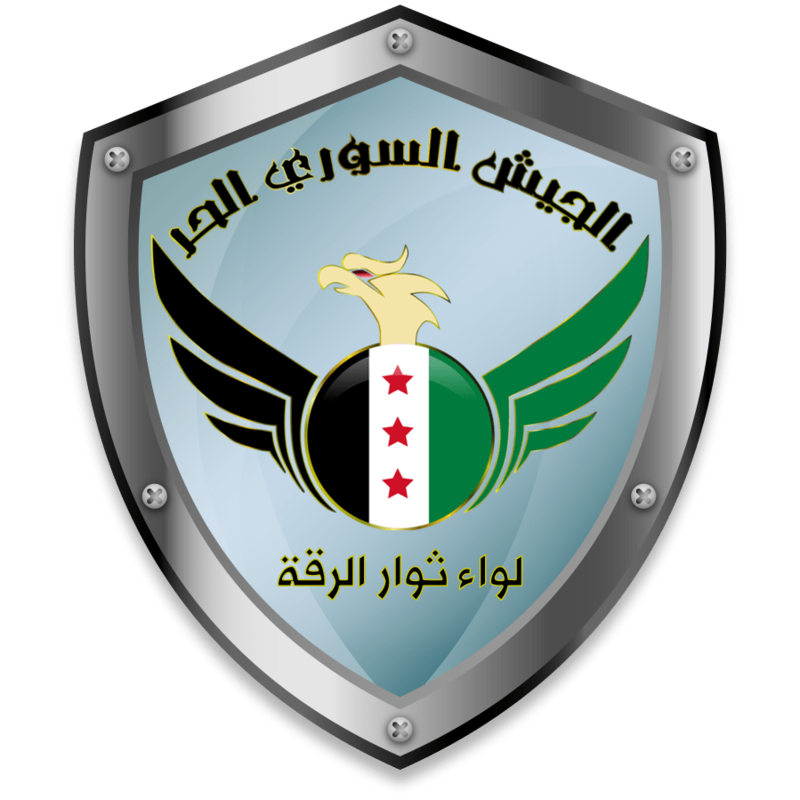 Liwa Thuwar al-Raqqa's first emblem. On top: "Allahu Akbar." Beneath that: "There is no deity but God, and Muhammad is the Messenger of God." Also in December 2012, Liwa Thuwar al-Raqqa joined the Raqqa Liberation Front coalition, alongside similarly aligned groups including the familiar Ahfad al-Rasul (a brand of Western-backed brigades that went into sharp decline in 2013, including expulsion from Raqqa city by ISIS in August of that year), Liwa al-Muntasir bi-Allahand Liwa Isar al-Shamal (both of which, like Liwa Thuwar al-Raqqa, identified as part of the same Revolutionary Military Council) and Liwa Rayat al-Nasr (which eventually joined the Salafi grouping Ahrar al-Sham). As has often been the case in the Syrian civil war with the various coalitions announced and dissolved, the Raqqa Liberation Front coalition never led to a real merger of these groups. Raqqa city fell in March 2013 to a combination of these brigades, Ahrar al-Sham and Jabhat al-Nusra. The following month, Abu Bakr al-Baghdadi announced the creation of ISIS, demanding the subsuming of Jabhat al-Nusra under this structure. Most of the Jabhat al-Nusra contingents in Raqqa province accepted Baghdadi's argument and defected, though a group under Abu Sa'ad al-Hadhrami broke away from ISIS in Raqqa city and temporarily took refuge in the city of Tabqa to the west of Raqqa city in mid-summer of 2013. Meanwhile, Liwa Thuwar al-Raqqa continued to operate as part of the rebels' wider bid to take the remaining regime bases in Raqqa province- Division 17, Brigade 93 and Tabqa military airport. Thus on 20 June, Liwa Thuwar al-Raqqa's leader Abu Eisa denied claims he had been killed by regime forces. 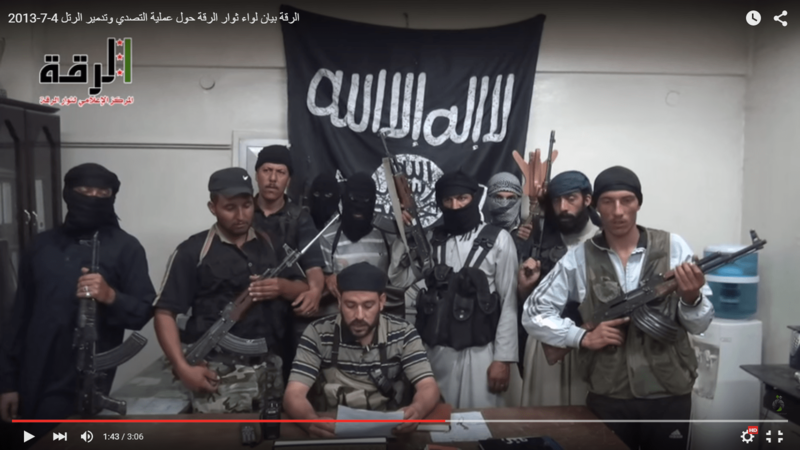 It is also notable that Liwa Thuwar al-Raqqa appeared to adapt somewhat to the ISIS presence in Raqqa, not only by adding the definite adjective 'al-Islami' (Islamic) to its name but also by using the same flag as ISIS in at least one video, as per below from July 2013, in which the group claims coordination with a number of formations, including ISIS, Jabhat al-Nusra and Ahrar al-Sham, Liwa Ahfad al-Rasul and Liwa al-Muntasir bi-Allah, in attacking a convoy that came from Brigade 93. Despite the apparent military cooperation, tensions became increasingly apparent in a number of ways. As ISIS' presence in Raqqa city grew with its da'wa office that set up numerous billboards throughout the city, it began detaining members of other groups, such as the leader of Liwa Amana' al-Raqqa (another of the independent, nationalist brigades), and moved decisively to expel Ahfad al-Rasul in August, despite cooperating with the same group on the Latakia front where an offensive had been launched to push towards Assad's ancestral village of al-Qardaha. This does not mean tensions solely revolved around disputes between ISIS on one side versus the rest of the factions on the other. 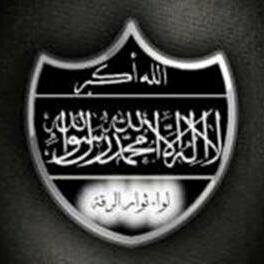 There were also tensions between Liwa al-Nasir Salah al-Din (another independent group at this point) and Ahrar al-Sham as they arrested each other's members, and Liwa Thuwar al-Raqqa reportedly had its own disputes with Ahrar al-Sham as well. Even so, all-out warfare between the various factions had not yet broken out, and the civilian local council continued to operate. In September 2013, Jabhat al-Nusra announced its 'return' to Raqqa city. Some of the smaller brigades saw in Jabhat al-Nusra the chance to protect themselves from the growth of ISIS, and accordingly pledged allegiance in some form. This included Liwa Thuwar al-Raqqa, though the exact terms of the allegiance are disputed. It appears Jabhat al-Nusra had hoped to integrate Liwa Thuwar al-Raqqa through Shari'a sessions, but regardless of whether or not this was actually agreed upon, it is therefore clear that Liwa Thuwar al-Raqqa was not properly integrated into Jabhat al-Nusra's ranks. This may have hindered the fight against ISIS when wider infighting broke out in January 2014. Components of other actors saw a stronger horse in ISIS (which detained and eventually killed Abu Sa'ad al-Hadhrami) and thus joined its ranks, a case-in-point being part of the Liwa al-Nasir Salah al-Din. As infighting spread between rebel forces and ISIS, Liwa Thuwar al-Raqqa appears to have taken the lead in fighting ISIS inside Raqqa city in January 2014, at which point it had broken off from Jabhat al-Nusra. However, ISIS did not suffer the same problem as elsewhere (e.g. in Idlib province) of being thinly spread out and was able to consolidate control of Raqqa city, expelling Jabhat al-Nusra, Ahrar al-Sham, Liwa Thuwar al-Raqqa etc. It would appear that the rebel side conversely suffered from problems of poor coordination in their efforts. Liwa Thuwar al-Raqqa then withdrew into the Raqqa countryside up to the Kobani enclave, seeking refuge with the Kurdish YPG. As the Liwa Thuwar al-Raqqa break-off from Jabhat al-Nusra had not been officially announced at the time, this was the origin of the ISIS narrative that Jabhat al-Nusra had entered into an alliance with the YPG. In April 2014 came Jabhat al-Nusra's announcement of the break between itself and Liwa Thuwar al-Raqqa. In September 2014, Liwa Thuwar al-Raqqa along with a number of rebel groups in the Kobani area joined the Burkan al-Furat ('Euphrates Volcano') coalition led by the YPG, and participated in the battle of Kobani as well as the subsequent push eastwards following the failure of the Islamic State to take the city. Liwa Thuwar al-Raqqa appears to have been the main rebel auxiliary force alongside the Kata'ib Shams al-Shamal formation of the Dawn of Freedom Brigades, which unlike Liwa Thuwar al-Raqqa draws its membership mainly from rebel groups (e.g. Liwa al-Tawheed) that existed in north-eastern Aleppo province localities such as Manbij. "Free Syrian Army: Liwa Thuwar al-Raqqa", with the familiar FSA emblem. "The Tel Abyad area will wholly remain administratively with Raqqa governorate and we do not accept modification of the administrative borders for Raqqa governorate and changing the affiliation of any area under the name of any entity. What is being circulated in suggestion about the affiliation of the Tel Abyad area in administration is not within the special powers of the local council or any other council or committee. This matter requires a law and legislative committee to decide on that. And we are in an exceptional state of affairs. It is not possible to adopt any decision to change the administrative borders or affiliation of any area." One should also note the reference to a 'local council' here: on 26 August, Liwa Thuwar al-Raqqa issued an invitation for participation in a conference for the election of the local council for Raqqa province, particularly calling on members of the nominal electoral committee to participate. This conference was supposed to take place on 28 August in the Turkish city of Urfa, but as the Arabic outlet al-Aan notes, it failed to lead to the election of a local council. Out of 107 members of the electoral committee, only 4 showed up alongside representatives of the opposition-in-exile government. It would appear that the majority of those from Raqqa province in exile do not see it as worthwhile to elect a local council to provide civilian support to Liwa Thuwar al-Raqqa, recognizing that the Islamic State still controls most of the province and the PYD is the true administrator of the important town of Tel Abyad, for which the PYD has already formed its own local and seniors councils. This is why, as I have emphasized before, it is highly misleading to go by Thomas van Linge's maps that portray Tel Abyad and similar areas as somehow jointly controlled by the YPG and the 'FSA', driven as Thomas van Linge is by an ideological agenda to hype supposed Kurdish-rebel unity. Yes, it may be that the PYD takes into accountfor the time being local Arab and Turkmen objections to incorporating Tel Abyad into Kobani, and certainly it has little interest in pushing further south to Raqqa city and thus delegates an area like Ain Issa to Liwa Thuwar al-Raqqa. Yet the playing up of 'YPG-FSA' cooperation tends to ignore the fact that the YPG has done the bulk of the fighting, sustained the bulk of the casualties, and as a result its political wing the PYD has come to be the administrator of the vast majority of localities retaken from the Islamic State. Corroborating this point for the Tel Abyad area in particular is an order from the PYD's Asayish police division forbidding travel between Tel Abyad and Raqqa, as well as importation of various goods from Raqqa to Tel Abyad, including building materials, fuels and electrical and manufacturing apparatuses. While these decisions are understandable in that the PYD worries that bombs may be smuggled in amid the imported goods and wants to cut off as many revenue sources as possible for the Islamic State in so far as the continued cash flow between non-Islamic State and Islamic State-held areas is key for Islamic State revenue via taxation, it is clear there was no consultation here with the rebel groups in Burkan al-Furat. To sum up, we have traced the evolution of the rise, fall and re-emergence of Liwa Thuwar al-Raqqa from 2012 to the present day, first as one of a number of indigenous, nationalist rebel groups in Raqqa province, to a non-ideological Jabhat al-Nusra affiliate, and finally to an uneasy, junior partner of the YPG. To shed further light on these issues, below is an interview I conducted recently with the director of Liwa Thuwar al-Raqqa's media office. Q: Jabhat al-Nusra says you gave bay'a [allegiance] but you deny you gave bay'a to them? You mean it was just a military alliance? A: It ended because of their lack of support for us during our battle with Da'esh and they withdrew from Raqqa without informing us of that. Q: In their statement on the end of the alliance they say that you had agreed on Shari'a sessions. True or not? 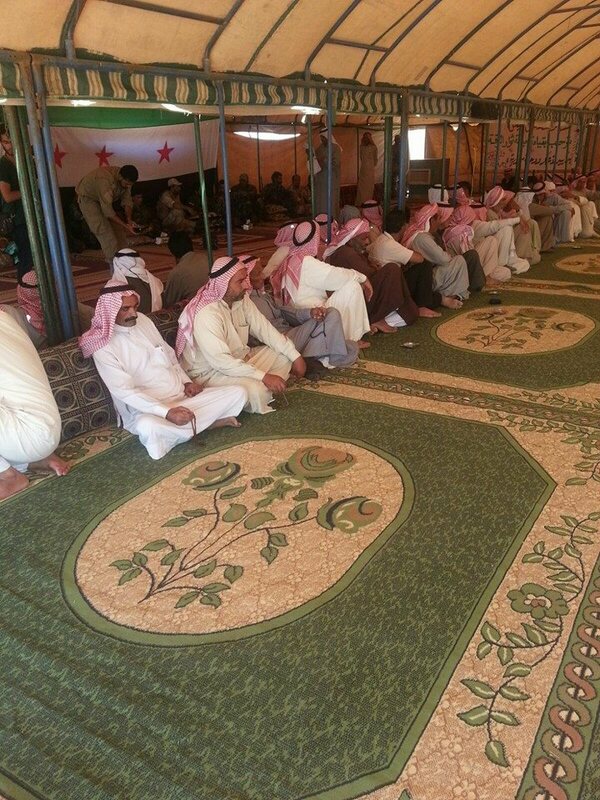 Q: After Raqqa fell to Da'esh's hand, did most of their [Liwa Thuwar al-Raqqa] members go to Kobani? Q: With regards to the other battalions in Burkan al-Furat are they administering liberated areas or do they only have a military presence? That is, if I understand correctly, Kata'ib Shams al-Shamal for example wants to recover Jarabulus and Manbij?